Now you can establish Aadhaar PAN linking offline by using one-page form. The entire process is manual. This is the third way via which Aadhaar PAN linking can be established. It may be noted that every individual holding PAN card on 1st July 2017 is required to intimate his/her Aadhaar number to Income tax authority. This can be done by doing Aadhaar PAN linking. The methods for Aadhaar PAN linking is given below. The second method of linking Aadhaar card with PAN card is via online website of Income Tax Department. In order to use this method, you need to visit www.incometaxindiaefiling.gov.in. On the left-hand side, you will find link “Link Aadhaar”. You need to provide the required information, PAN, Aadhaar Number, Name as per Aadhaar, Date/Year of Birth etc. Once you are done with filling this information you need to enter either captcha code or request OTP on register your mobile. Once you are done you need to click on “Link Aadhaar” to link your Aadhaar with PAN. 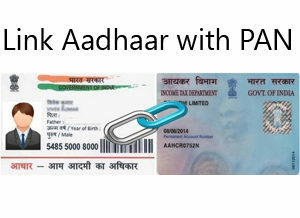 The third method of linking Aadhaar with PAN is an offline method using one-page form. This entire method is offline. In this method, you need to visit designated PAN Service Center of PAN Service provider NSDL eGov or UTIISL. You need to provide one-page form along with PAN card and Aadhaar card copy. 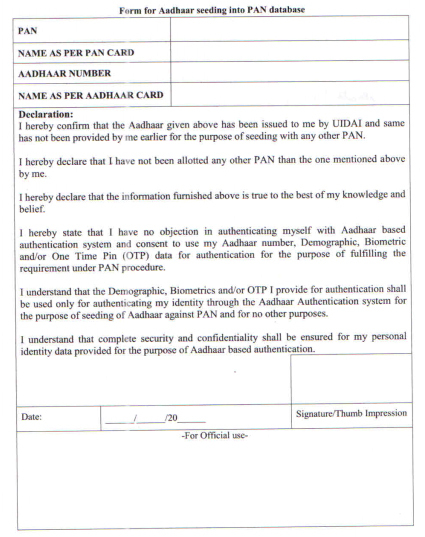 The copy of one page Form for Aadhaar seeding into PAN database is given below. You need to provide PAN, Name as per PAN card, Aadhaar Number and Name as per Aadhaar Card. PAN holder may authenticate Aadhaar Biometrically on visit to such PAN service centre. Biometric authentication shall compulsorily be required in cases where there are sufficient mismatches in PAN and Aadhaar data. Details of designated PAN Service center shall be published by PAN Service providers on their respective websites i.e. www.tin-nsdl.com for NSDL eGov or www.utiitsl.com for UTIITSL. It is paid service and approved prescribed fee will be levied by PAN Service center on PAN holder who files a request for Aadhaar seeding. Hope above methods will help you in linking your Aadhaar Card with PAN card.